As long as Kice has been in business, Kice has been applying and building high efficiency cyclone collectors. Cyclones were some of the first items Kice built shortly after WWII. Kice engineers have studied most cyclone designs and theories and have developed a simple line of cyclones that maximize efficiencies while maintaining affordable prices. 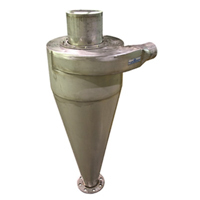 In general, cyclones are used to remove dust and other product streams from processing operations. There are many factors that directly affect the efficiency of a cyclone. Tests have shown that, in general, the longer the cone the higher the efficiency. However, physical limitations on site sometimes limit the height available. Kice engineers performed extensive testing to determine cone lengths that maximize efficiency yet keep plant restrictions in mind. The manner in which the air and product enters the cyclone also affects its efficiency. Kice pioneered the concept of keeping the inlet centerline tangent to the outside edge of the cyclone. This smooth introduction reduces turbulence and increases efficiency of Kice cyclones. Kice refers to this as an externally tangent inlet. The smoother the inside surface, the more efficient the cyclone. Along the same lines, perfect roundness maximizes efficiency. Kice employs state-of-the-art cutting and rolling equipment to ensure that Kice cyclones are perfectly round and symmetrical with smooth interior surfaces. Most importantly, Kice process engineers have the experience and know-how to properly size and apply Kice cyclones. Air volume, density, temperature, humidity along with product characteristics sometimes create complicated sets of criteria. Kice’s experience in designing systems along with its expert craftsmanship provide our customers with highly efficient cyclone applications. Kice CK cyclones are completely welded with angle ring reinforcing. They are designed for industrial applications that handle 500 – 50,000 CFM. Tests prove that Kice CK cyclones are as efficient as most “high efficiency cyclones” available in today’s market. However, Kice CK cyclones have a minimal pressure drop (2-4” wc). Other “high efficiency cyclones” can have pressure drops as high as 12” wc. Lower pressure drop means less required horsepower on the fan which saves you significant dollars over the life of the cyclone. 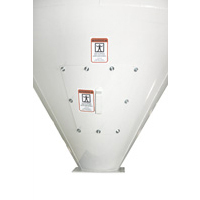 Kice CE/CD/CC Cyclones were designed for removing product from smaller diameter, pneumatic conveying lines. The height of the cyclones allow multiple cyclones to be “banked” on common benches. This allows for simple suction manifold installation on the cyclone’s air outlets. These units are completely welded and provide very affordable solutions to most industries. 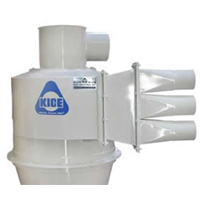 Kice Horizontal Separators were designed to remove a decent percentage (75-85%) of a dust stream prior to it being introduced into a baghouse filter. The installation of a Kice Horizontal Separator ahead of a baghouse filter will greatly increase the life of filter bags. 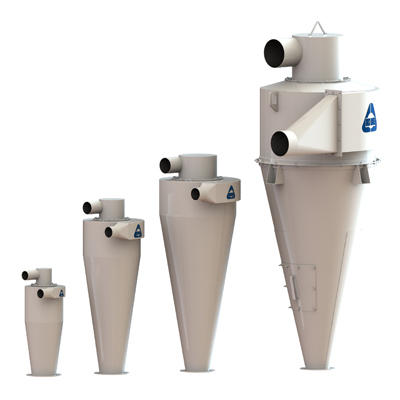 In general, the larger the particle size the greater the efficiency of these units. Materials of construction include painted mild steel or stainless steel. Many other types of materials have been used by Kice over the years for special applications and continue to be available upon request. 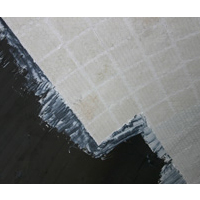 Interior liners can be supplied for wear resistance. 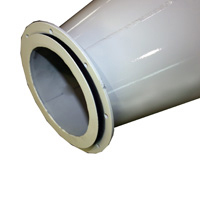 The two most common are 3/16” abrasion resistant steel and ceramic lining. 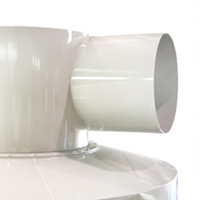 Horizontal Air Outlets, sometimes called ‘pull-thrus’, are standard on Kice cyclones. Rain caps are also available for installations where air is vented directly to the atmosphere after the cyclone. 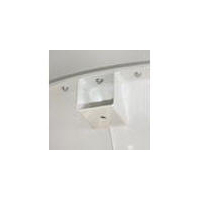 Air outlets can be supplied with control dampers.